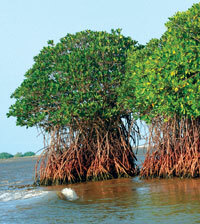 MANGROVES are known to be reservoirs of carbon. While it is known that widespread degradation of the mangroves by 30-50 per cent over the past half century due to coastal development, aquaculture expansion and over-harvesting may be responsible for an increase in carbon in the atmosphere, nobody has been able to tell how much. This is due to lack of broad-scale data on the amount of carbon stored in these ecosystems, particularly below ground. 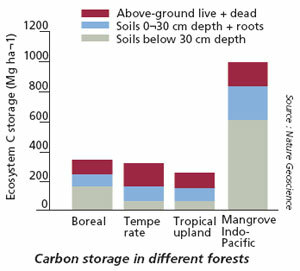 Carbon in soils in which mangroves grow is difficult to quantify because it varies with time and sea levels. Only limited components of carbon storage like tree biomass have been reported in most of the studies till date. Now a team of researchers led by US Forest Service’s Pacific Southwest and Northern Research Stations have quantified the amount of carbon stored in mangrove ecosystems. To calculate it they took into account soil carbon content and soil depth along with tree and deadwood biomass and utilised ecological sampling and biometric techniques. The study was published on April 3 in Nature Geoscience. They studied 25 mangrove forests spread across the Indo-Pacific region. The mangrove area and diversity is the greatest here and accounts for 40 per cent of the total mangrove ecosystems in the world. Two major geomorphic settings—Estuarine mangroves (situated on alluvial soil deltas) and Oceanic mangroves (situated on the coast of islands)—were considered. In both the settings they found the below-ground carbon content was more than the above-ground carbon levels. The below ground content was 71-98 per cent and 49-90 per cent of the total storage in estuarine and oceanic sites respectively. They say per hectare mangrove forests store up to four times more carbon than most other tropical forests around the world, containing an average of 1,023 mg carbon per hectare. Their deforestation accounts for 10 per cent of the emissions globally. “Scientific community has long suspected that mangroves store a great deal of carbon, but so far there had been no attempt to quantify this. The study fills that gap,” says Daniel C Donato, lead researcher. Mangroves can be strong candidates for climate change mitigation strategies, he adds. Deforestation and land-use change currently account for eight to 20 per cent of global carbon emissions, second only to the use of fossil fuels. “Almost 30 per cent of the mangrove cover in India has been destroyed in the recent past. The study is a wake-up call to the global increase in carbon levels in the atmosphere and warming, and resultant sea level rise,” says T G Jagtap, Scientist at National Institute of Oceanography, Goa.